Issues of thrombosis, bleeding, and transfusion are extremely common, and often complex, in critically ill patients. 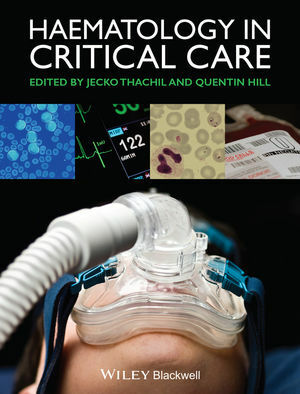 Haematology in Critical Care: A Practical Handbookprovidesa dependable source of expert guidance on how to handle common haematological problems seen in the critical care setting, as well as the acute care of patients with a primary haematological disorder. Full-time clinical haematologists, regularly attending on intensive care, the Editors begin with an approach to abnormal laboratory tests, following with a disease-orientated approach to topics such as coagulation and haematological malignancy. Other key topics include paediatric and neonatal care, transfusion, point of care testing and the emergency presentation of haematological disease. This title brings together two of the most highly scientific specialties in clinical practice, delivering a practical approach to these problems, and guiding the clinician through the diagnosis and management of common scenarios encountered in the ICU. Dr Thachil co-chairs the Disseminated Intravascular Coagulation Subcommittee of the International Society of Thrombosis and Haemostasis and is the review editor for Physician Information and Educational Resource for American College of Physicians. He has authored over seventy publications in peer reviewed journals and has co-authored the British committee of Standards in Haematology guideline for DIC. Dr Thachil also has research collaborations with intensive care staff in the northwest England and is the organizer of Haematology in Intensive Care educational sessions for the region. Dr Hill has been principle investigator for a number of phase II and III clinical trials and has published 6 peer reviewed journal articles (5 as first author). He has also written book chapters for "Problem Solving in Haematology" published in March 2010 (ISBN: 1846920051, Atlas Medical Publishing, Ltd). He provides attending cover for a 40 bedded haematology unit. He often interacts with intensive care staff and has developed an interest in critical care issues during this time. Dr Hill has published a single author review on survival of critically ill patients with haematological malignancy in 2010 and has submitted a further paper on regional ICU outcomes for publication. Dr Hill has lectured on this subject regionally and nationally.